Uses of the Internet in our daily life is depending on desires and goals. Activities in our daily life are decided after the use of Internet. Internet innovated our daily life. We spend lot’s of time on the Web. Positive use of the Internet makes our lives easy and simple. The Internet provides us useful data, information, and knowledge for the personal, social and economic development and it is up to us to utilize our time on the worldwide web in a productive manner. The Internet is a revolution in information technology. While there are various uses of the Internet but you can use the internet for getting an online education. You can use the Internet to promote your business online. You can do online courses and improve your writing, communication, business and online marketing skills. Online shopping, social media, emails, chatting are common things that we do daily. You are free to use the Internet. The Internet is a magical tool that will help you to become successful in your career and business. But only the positive and productive use of the Internet. For example learn here: 27 productive things that you can do on the internet. The global network of computers has changed our lives tremendously. We are hungry to use the Internet. That’s why more than 40% of the world’s population is connected to the Internet according to internetlivestatus.com. This is because we are connected to various information and lifestyle facilities. It is because a large number of new people are getting connected to the Internet via their portable devices every day. We start our day after notifications and emails. This means that as soon as we wake up we are flooded with information from different sources. Sometimes it is struggling to prioritize and decide which information is useful and which is not. Using the Internet positively means we can decide what is important for the day. The Internet is a sea of data and information in which a little dip can speed up and change the way we live and do business. That’s why it is really important and challenging to use the Internet in as many of our daily life activities as possible. The use of Internet in education is providing new opportunities for both students and educators alike. There are many Productive things you can do on the Internet. So, Let’s start to know one by one what role Internet is playing in our lives. How is the Internet affecting our life? What INTERNET activities we are doing daily? Students have a free platform to learn throughout their lifetime. People in the age group 18 to 35 are among the most frequent users of the Internet today and these people are mostly students from all over the world. They are using the Internet to learn new skills and even acquire degrees in professional online courses. Similarly, educators like us are using the Internet for teaching and sharing our knowledge and experience with the world. There are many websites which help to explore what your hidden potential is and which profession would suit you the best. It wasn’t possible before the advent of the Internet to expand knowledge at this speed. That’s why the Internet is playing a crucial role in our education. Now it is possible to get study material and resources for all classes at http://www.ncert.nic.in/ncerts/textbook/textbook.htm This is how students can use The INTERNET in their daily life. Related: Use Facebook for Knowledge. Our routine is initiated by the Internet. It is the first thing in the morning we do- see our notifications and emails. The Internet has made human life so much easier, now the biggest and toughest tasks are done in minutes. 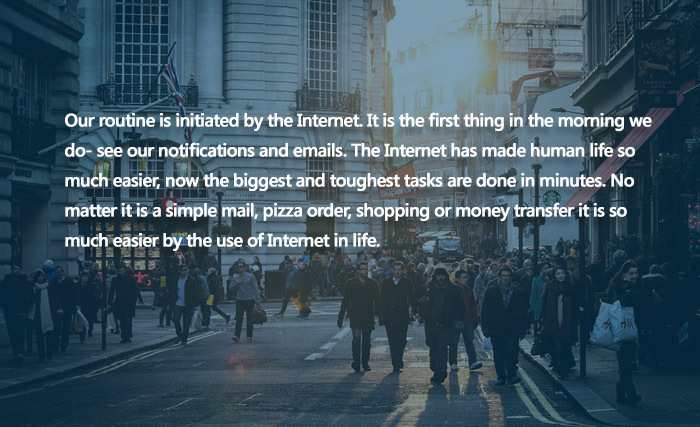 No matter it is a simple email, pizza order, shopping or money transfer it is so much easier by the use of the Internet in life. We also use the Internet to promote our business. We can sell our products by using various e-Commerce solutions on the Internet. E-commerce is booming on the Internet and we can see new services and creative business starting up every single day, which in turn is creating jobs and thereby reducing unemployment. I think if our youth of India or from other countries learn and use the Internet seriously they can get hundreds of options for their careers on the Internet. I believe that the uses of the Internet in business have brought about an exciting stir in the business world and it will not hold back anymore. 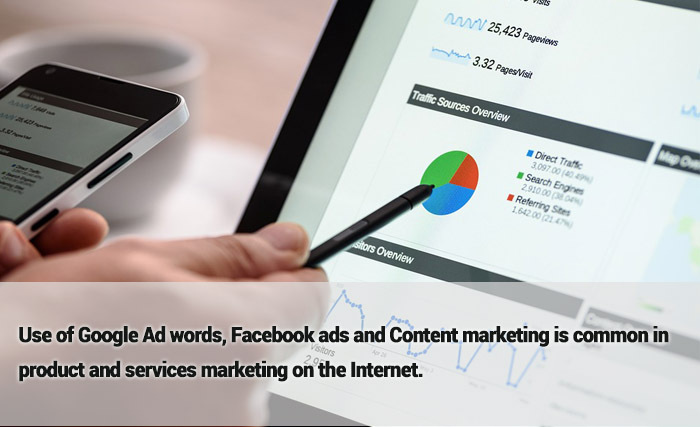 Use of Google Ad words, Facebook ads, and content marketing is common in product and services marketing on the Internet. People are always looking for the ways on the Internet to grow their business. Shopping has become a hassle-free task now and almost anybody can order products online after comparison with other websites. The boom and the resultant competition in online shopping business are evident. Shopping sites are more interesting because of huge discounts different companies are offering customers. People are attracted to them and this is good news especially for the Indian shopper because of our frugal spending habits. 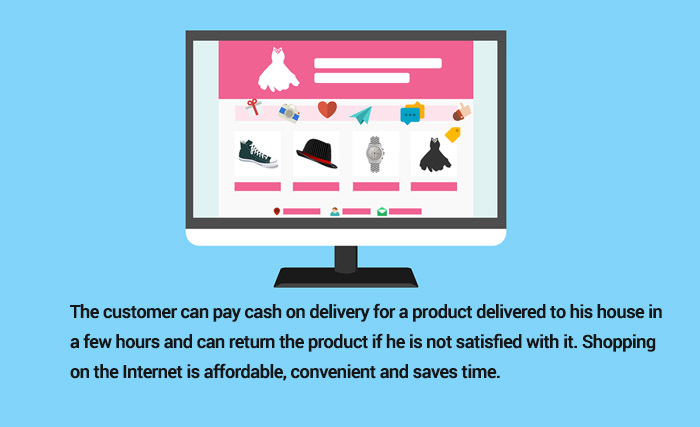 The customer can pay cash for delivery of a product delivered to his house in a few hours and can return the product if he is not satisfied with it. Shopping on the Internet is affordable, convenient and saves time. The Use of flipkart.com, alibaba.com, amazon.com, paytm.com, snapdeal.com etc. for online shopping is common. That’s how the Internet is affecting our shopping habits in daily life. And all this process is called eCommerce. eCommerce has changed business and now it’s important part of our life. The pace of work towards innovation and quality of research is developed by Internet tools. It is not tough to the research on the Internet. From small business owners to big universities everyone is getting the benefits of the Internet for research and development. Data analysis, data entry, data research, data management etc. services are in demand. A person who is a Data scientist and data analyst are really important for innovative decision-making. Even the importance of Microsoft Excel in business is being realized by people now. Similarly, CRM and Google analytics is helping businesses to analyze the consumer’s behavior on the websites and advertising campaigns. Decision making is an important part of all kind of business and organizations. Success and failure depend on our decision. After the rise of online business and higher competition on the Internet to conduct business, it’s really important that decisions do not be a burden on the organization. That’s why today you can visualize, analyze and monitor customers data in real time by using data analysis tools. That helps business to remain competitive in the market by better data analysis. Any information we need regarding health, money, law, RTI etc. everything is in front of us within a few seconds. So, it is really important that we use the power of the Internet for practical benefits. The Internet is undoubtedly the most effective and far-reaching communication tool we have at present. Communication on the Internet is free and fast. We all are connected with each other on various computers and IP. Skype, chat messengers, social media is common for personal and professional purposes. 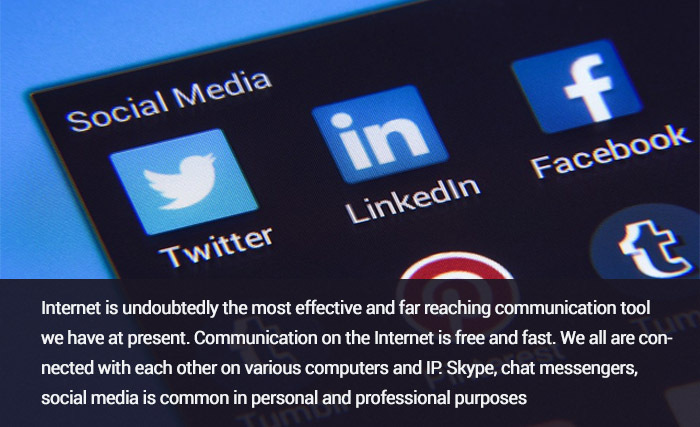 Indeed we are also using standardized communication protocols but the Internet evolves constantly by using artificial intelligence and search engines to find out how we communicate, how this can be made simpler for us to use and have a better experience in the shortest possible time. This ability to communicate at breakneck speeds enables us to finish our tasks faster and become more efficient. It is obvious that the presence of the Internet has made doing business much easier. But it has also created its own set of challenges such as high competition, need for quality content etc. But knowledge is power and anyone can do business and job after learning more about it. As the newer generations start to log into the Internet there are possibilities of completely new business and jobs. Nowadays the Internet is widely used in making money. If you have talent, then you can earn money by sitting at home on the Internet. It is hard to imagine how many people working in 9-5 jobs want to leave into jobs and work independently as freelancers or start their own Internet business. The emergence of websites such as Upwork.com, Freelancer etc. websites has given people the option to work remotely (from home) according to their own schedule and commitment. Thousands of freelancer or professionals are doing this on a daily basis to earn more than their bread and butter cost. Facebook business pages, Google AdWords, Paytm, blogs, YouTube channels, Amazon and other affiliate marketing methods etc. are various tools used to make money by providing things of value to Internet users. If you have an idea which can provide a facility to people then you can start an online business by using any computer and information technology tool. You can read about Advantages of online jobs on upwork for freelancers to know more. The use of the Internet is not limited to only earning money, it can also be used to manage money. We can now see hundreds of websites, apps, and other tools that help us in handling daily transactions, transfers, management, budget planning etc. and this trend is growing steadily. The use of Internet banking and mobile banking use is also growing. All the banks are really working hard to provide Internet banking and mobile apps to empower people to utilize the power of the Internet and latest money management tools. Buxfer.com, mint.com etc. websites and apps are providing free and premium services to manage your money. And for small business accounting QuickBooks is the #1 rated small businesses accounting software. Everyone wants to know How to save more money, and the Internet provides the knowledge to do so. Internet is a great tool for politicians to connect with people. The uses of Internet are not only in personal and business life but it is common now in politics. Politicians are using various methods to influence people and youth on social media to favor their party. They are also using it to criticize other political parties. Our Prime Minister of India Mr Narender Modi and Chief Minister of Delhi Mr Arvind Kejriwal are very active with their followers on Twitter and Facebook and sharing views on a particular topic. It is a widely accepted fact that Mr Modi’s success is largely attributed to his presence on social media and an active social media team. It is also good for people to know about the progress of ministers on a particular task. If governing political parties use social media to show the progress of their work then it is great. But if they are only using for condolence purposes then I think they have to think again about their social media political strategies. The Internet is a very important tool for educators. The Internet and its application is user-friendly and make students life easy. A teacher can use YouTube channels to teach students around the world. Teachers can use the blog in which they can share their career experiences with college graduates. There are various websites for teachers such as Skillshare, udmey etc. If you’re free and want to spend your time in doing productive things then create your own website. In the website, you can train people about the skills you’re a master in. Here are the complete details about the productive things you can do on the internet. You can determine the importance of internet that it is most used today to solve the problems of others. Online forms, social groups are the platform in which you can provide a solution. For example, people ask on Quora and then people who know the solution answer. This use of the internet is not only beneficial for others who are getting the solution but also for the people who give the answer. Answer provider on the forums are mostly bloggers, internet marketers, and business. They use such platform to connect with their target users or clients or readers. The Internet is very useful for economic development. The use internet banking, mobile banking, and e-wallets also help at some point to decrease corruption in India or in any nation. It’s because when using digital transactions it will be recorded in the database. Bank database can be easily tracked by income tax department. So, it will be helpful for a government that all income tax pair shows correct details or income report in the ITR. Another thing is that offline cash transactions often not calculated and mentioned by people such as rent. If we use the internet or cashless internet transactions then it will help others to show their income report. If we’re giving rent money in cash or paying in cash for other services then it is highly possible for the receiver to hide that money for income tax report. I am not saying that it should be mandatory to use but it can be helpful. But for that people also need education and awareness about internet banking. Also, banks need to update their banking systems. The government also needs to create privacy and cybersecurity policies etc. So, uses of the internet in digital transactions are time-saving and helpful for the country. But be aware of cyber crimes and get more knowledge about internet security. The Internet can play very important role in Environmental development. We can use Internet tools such as social media and blogs by promoting environment development activities. Sharing valuable information and knowledge regarding trees, plants and water will make positive effects on the internet users. There are billion people use the internet if each day one people inspired to save trees and plant then it will be a great use of the internet. Not all parents are computer and the internet literate. But the internet literate people can use the internet to guide their kids. They can analyze the content on the internet better than students. So, they can suggest what is helpful for kids to do on the internet. Another thing is that they can help kids in their studies and education. I know various kids know more about the internet than their parents. But it’s highly important for parents to guide children for the best use of internet in daily life. Uses of Internet in tour and travelling are highly effective. We now search on Google before visiting the places. We booked our tour by the use of the Internet. We can read blogs about tour and travel experiences and tips. Tour and travelling service providers and companies are using innovative ways and marketing campaigns to attract people to their website to book the tour package. We can now compare the tour package prizes on the INTERNET and choose the one which best suits our budget and requirement. The use of the Internet is highly effective because now we can see and analyse the place before we book our tour package. This is one of the biggest uses of the Internet. The right utilization of Internet power is challenging for governments across the world. Government expenses are reduced due to providing data and information for people on the government websites. People are taking advantages of Government policies and websites. Any government information and service are easily accessible for the citizens. Using tools such as Right to Information, we can have online access to important government documents. So, after seeing the above uses we have to agree that the Internet is playing an irreplaceable role in human development. No field can exclude or escape this ever-growing world wide web we call the Internet. Economic development is becoming stronger by the use of the Internet in any country. Till the use of the Internet is done for good things our social, economic development will continue. The Internet is harmful if we’re using it for wrong things and wrong ways. Our daily activities are enhanced and our knowledge expanded by the Internet but at the same time Internet is providing powerful development tools for humans. That’s why the good uses of the Internet are really important in everyday life. Today almost all the things are connected and working through the Internet. There should be no doubt that Internet is becoming the engine of every new invention. Such as machine learning, cloud computing, business intelligence, internet of things, automation and artificial intelligence tools and services evolution never possible without the Internet. Related:How can artificial intelligence benefit humans? Share this article with your friends, by using following social media sharing buttons. Following is the affiliate ad of Udemy where you can take almost all kind of courses online such as programming, marketing, designing and personal development etc.